Welcome to the shop section of the website. 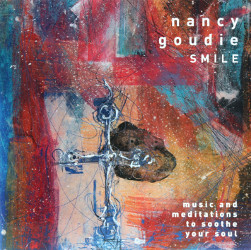 Each product Nancy has available is listed below. Please note that when you click to buy a product on this page you will be re-directed to the ngm shop where you can complete your purchase. If you are a retailer wishing to stock any products then please contact us on info@ngm.org.uk or call 01454 414880. If you have any questions or any problems with your order then please contact ngm on 01454 414880. 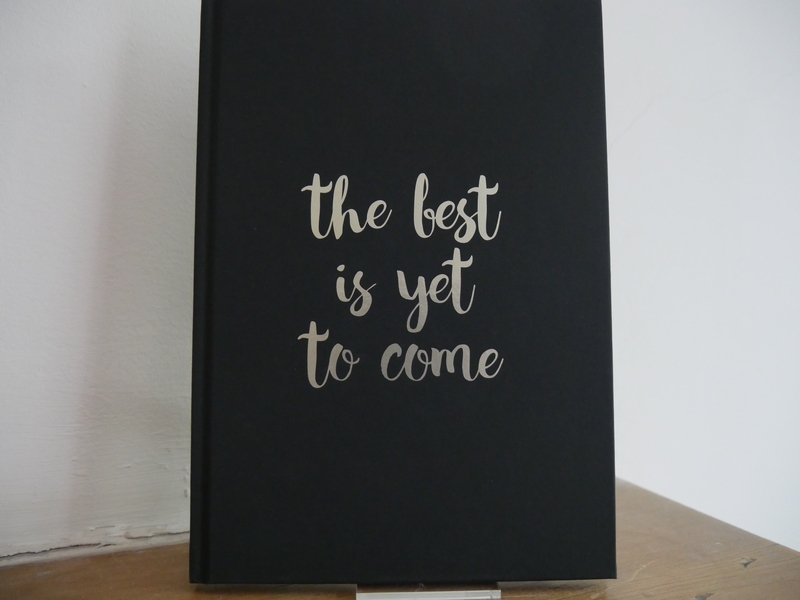 Each month we try and highlight a specific product in the store, this month is the brand new journal from Nancy – The Best is Yet to Come – only £6.50! This journal has a page from Nancy at the front of inspiration and ideas of what you can fill the journal with, and then beautiful blank pages afterwards for your notes, thoughts or drawings. With a lovely quality finish this is a great addition to your journal collection and also an ideal gift for others! This book tells a story of courage in the midst of pain, peace in the midst of sorrow and trust in the midst of confusion. 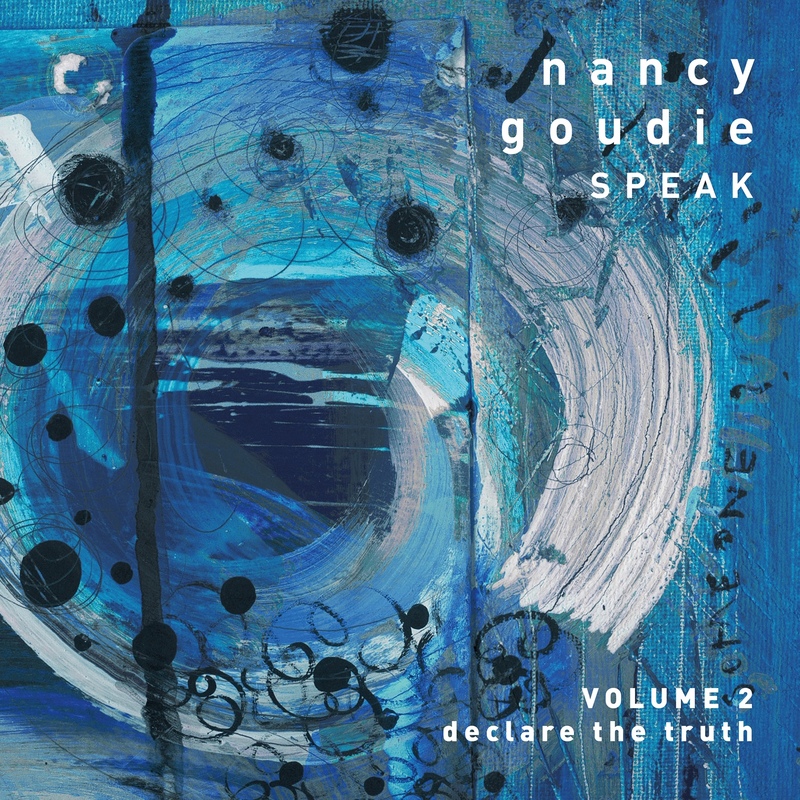 Its a story of love and devotion in the midst of one of the biggest challenges Ray and Nancy Goudie have ever known. This is an honest, deep and raw story that will touch your emotions, making you laugh as well as cry. It’s a story that will fuel your faith in God and ignite your passion for his presence. 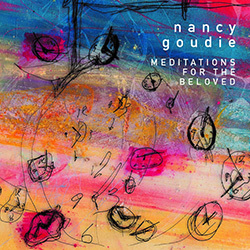 This unique and creative book helps you to spend time in the secret place and will transform and deepen your intimacy with God. Each practical exercise takes you on an exciting, creative journey of meditation, hearing from heaven, writing a psalm and real encounters with God. There are times in our lives when we need an oasis, a place where we can go to receive a thirst quenching drink for our souls. This book is an exploration of what it means to live in the oasis of delight, tasting its fruit, relaxing and relishing in the lush surroundings; free to explore and enjoy the depths of his fullness of joy and his pleasures forevermore. It inspires us to enjoy the delightful fruit of intimacy with God whilst all the time pointing us towards the day when we will be in the ultimate garden of delight for eternity. This book is a book of hope, it is a book filled with many miraculous stories of hope that will encourage and renew our faith in God. This is a book that will refresh the reader, physically, emotionally, mentally and spiritually. It is designed to place seeds of hope into the barren places of our hearts and encourage those seeds to grow and develop so that our faith will soar. In our culture of stress with so much pressure to look good and be famous, we often need to be reminded just how unique, precious, remarkable and extraordinary we are! In every page of this book you will discover the truth about yourself and realise afresh that you are deeply loved, special and accepted. This book is for anyone who sometimes swings from being confident to feeling a failure. It’s a book full of encouragement, wise words, poems, songs and stories to lift your spirit and get you back on your feet again ready to face life once more. Any time you are feeling down, unloved, critised or critical of yourself and life hits you hard, then pick up this book and flick through its pages. Each page is designed to bring you words of encouragement, hope and love. Allow it to restore your joy and build up your soul. Take it with you wherever you happen to be. This is an incredible book which you can open at any page and you will find something either to make you laugh and giggle or something to encourage you to laugh out loud. Laughter is an amazing gift and experts tell us that laughter has huge benefits for each of us. Just 15 minutes of laughter can give the same benefits as two hours sleep. This is a very naked and honest autobiographical account of a time when the world around Nancy started to collapse. Her husband, Ray fell into a dark pit where he experienced ill health and burnout. At the same time God was taking their ministry, ngm, through a shift, which caused much pain and insecurity and led to many people eventually leaving. Special offer! 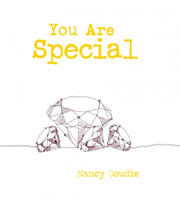 3 greats books by Nancy Goudie – Confident?, The Beloved and You Are Special for only £13! Special offer! 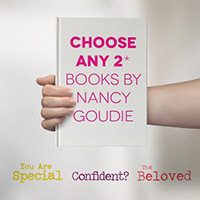 Choose TWO great books from Nancy Goudie’s Confident?, The Beloved and You Are Special and get them FOR ONLY £9! This is a book many people said they couldn’t put down. It is filled with many stories of H.O.T. faith. 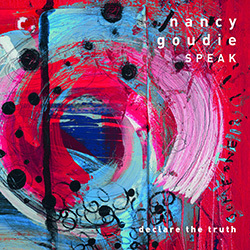 Based on a principal seen throughout scripture, Nancy teaches us how to hear, obey and trust in God and develop H.O.T. faith. Nancy shares many amazing miracles that happened throughout Heartbeat and ngm, as well as the miraculous five year journey of faith to get a £3 million mission and arts complex as ngm’s base. This is a book that will help your faith to soar. Are you feeling overwhelmed? Are circumstances or people getting you down? Are you in need of encouragement? Does everything seem impossible for you? Then I have news for you! What we speak has power and therefore when we confess the truth contained in the word of God, power is released and the word brings life. Speak life and truth into your circumstances and let’s see God do a miracle! If you are feeling the daily stresses of life, the busyness of work, the pressures of family or you just need soothing for your soul, then this recording is for you. I am convinced that having joy and taking the time to smile can be such a positive force in the world. This CD can help transform you into being a person full of joyful energy and perhaps propel you into some new avenues of opportunity. If you have ever experienced stress, carried worries or fought fears, or are just looking for an oasis in your busy life, then this CD is for you. 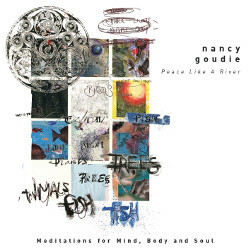 This recording will take you to a place of tranquillity where peace, love and grace are in abundance. Each journey will take you to a positive and peaceful destination. Do you know you are loved? Do you realise you are valued? Do you understand you are special? So many of us struggle with confidence, our self-image and our mental ability to believe we are worthy. We don’t value ourselves and therefore we cannot see how anyone else will value us? Do you know God delights in you and celebrates you? Do you realise that he sings songs of joy and delight over you? Do you struggle with the ability to see a joyful future full of hope? God not only believes in you but he has wonderful plans and purposes for your life. Who are you listening to? Who are you believing? We need to listen to the truth of the word of God rather than listening to the lies of the enemy. We need to believe the word of God rather than believing the enemies lies. There is power in the spoken word, so read, believe and confess the truth and see your circumstances and your life change for the better. The 2018 edition of Spiritual Health Magazine is full of exciting articles, interviews and much more. 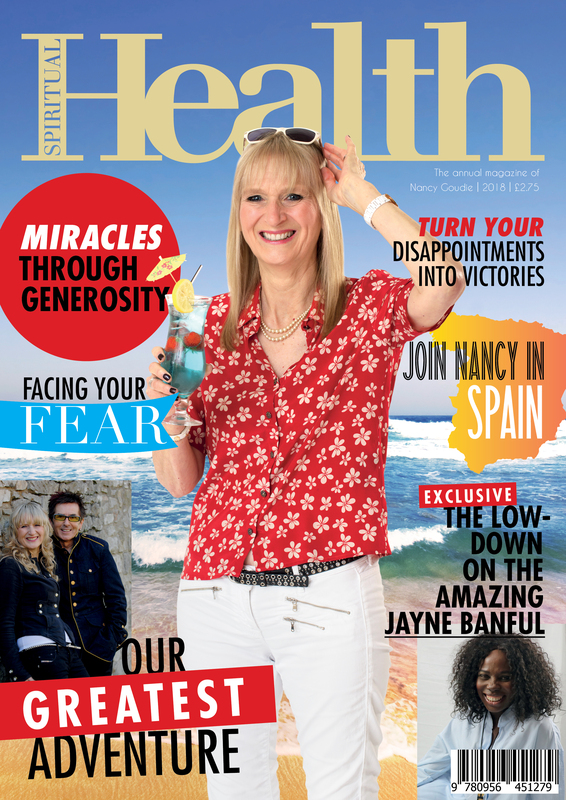 Featuring an interview with Jayne Banful, an extract from Nancy’s new book plus other inspiring stories. 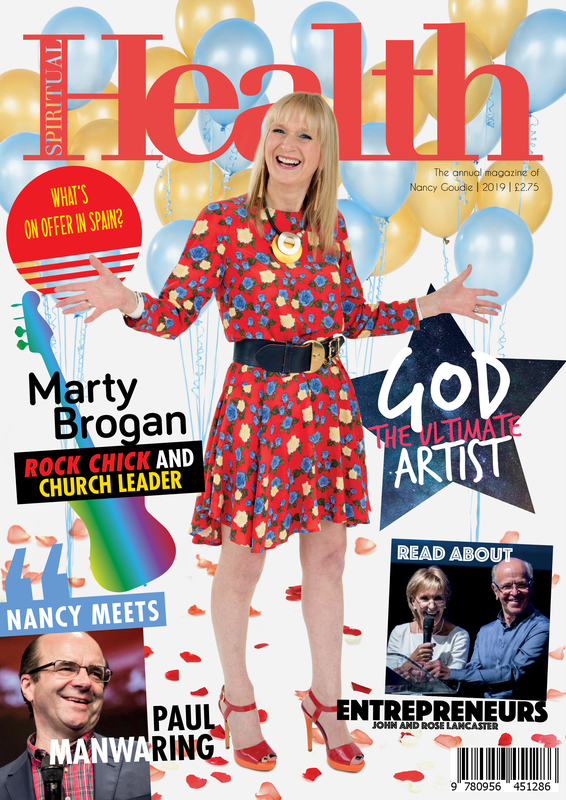 The brand new 2019 edition of the magazine featuring an interview with Paul Manwaring, inspiring and uplifting articles from Nancy and much more. Always wanted to read through the entire bible but found the thought of it a bit daunting? Well get rid of that thought with Nancy Goudie’s Bible planner! Read through the entire bible in one year, reading selected passages every day picked out by Nancy. Always wanted to read through the entire bible but found the thought of it a bit daunting? 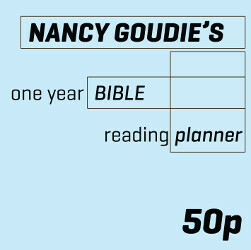 Well get rid of that thought with Nancy Goudie’s Bible planner! Read through the entire bible in two years, reading selected passages every day picked out by Nancy. The best is yet to come! 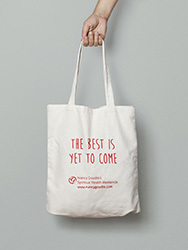 And now you can carry this great bag around letting everyone know the truth!